The sun is shining, the sky is clear. Summer is here. And it’s a perfect time for some outdoor grilling. At the same time, a whole lot of us are itching to travel, tired of being cooped up in the house after a long winter. That means a bit of camping or going to the beach. It could even mean loading up the RV for a long road trip to see the sights all over the country. Fortunately, we get to enjoy those two activities together. In the early 20th century, camp grills were mostly all we had, and they epitomized the phrase “roughing it.” Today, we have portable grills that we have many of the features of permanent grills, ensuring that you get to enjoy true outdoor cooking in your travels. Cooking on the go has never been made easier. Now, there are various types of portable grills available in the market; some are fashioned for tailgate parties while others are more suited for the great outdoors. There are even portable grills for RVs. But before you go buying the first portable grill you see on sale, you’ll need to be sure that the one you buy will match your needs AND your budget. Below are short reviews of various portable grills in each category (based on fuel source). Be sure to check them each out to find out which one would be perfect for your summer trips. Coleman is a name we all associate with the great outdoors. And part of being outdoors is grilling which means that Coleman has a broad range of grills for consumers to choose. One of which is the Road Trip LXE. It is probably one of the best portable gas grills the brand has ever made. It has two 10,0000 BTU steel burners that are controlled independently with heat control knobs. It has two porcelain-coated cast iron cooking grates that have a total of 285 square inches of cooking space. You get matchless lighting with the InstaStart (electric) ignition. The LXE comes with a collapsible stand with two wheels as well as sliding tables on each side of the grill. Three built-in tool holders are found under the heat control knobs. The grill also features oval heat diffusers that cover the burners for even heat distribution as well as for burning any grease that drips from the meat for added flavor. For easy cleanup, the grill also comes with a removable grease tray. Along with the stand, the entire grill weighs 41 pounds which is the heaviest of the three portable gas grills we’ve reviewed. However, the Coleman grill already comes with a cart that makes hauling it to and fro a breeze. There’s a lot of things that this portable gas grill has going for it. The cooking surface is large enough to feed a family of five or more. There’s little assembly required (though it’s a bit more than what the other two require). The independently controlled burners add greater versatility to your cooking. You can do 2-zone cooking or just cook different types of food at different temperatures at the same time. To increase the grill’s flexibility, grates are removable and can be replaced with other types of cooking plates such as a pan grate or griddle (sold separately, of course). At 41 pounds, the weight of the grill can be off-putting for some because just thinking about carrying something that heavy can break my back. Fortunately, the heaviness of the grill is mitigated by the stand and its wheels. Whether it’s standing upright or in a folding position, moving the grill from point A to B is incredibly easy. And the weight just adds to the grill’s stability. No need to worry about the grill falling over because of strong winds, etc. Also, the LXE is solidly constructed; nothing will break apart while you are rolling it around the place. Other advantages of this particular grill are the even heat distribution and excellent heat retention. You don’t have hot spots that cause you to move your food around. And you also get to cook your food pretty fast. Cleanup is also relatively easy. The removable grease tray and grates make possible to wash them in the sink with some hot, soapy water. But, just like any grill in this review, there are some stuff that makes you wonder if this grill is for you. Again, we mention the weight because it is quite significant. While you won’t have to worry about carrying it a great distance, you do have to worry about possibly lifting it out of the trunk of your car. Another drawback is that the burners are powerful. Yes, this is a disadvantage because there’s a bit of a learning curve to get the temperature right. The grill can get very hot and since there isn’t a built-in temperature gauge and the control knob only has a low and a high setting with a large empty space in between, you really will need to guesstimate the correct temperature during your first few tries. One last thing we don’t like about this grill is the lid clearance which isn’t very high. Unlike the Weber Q1200, you can’t cook small roasts like whole chickens here. Then again, if you’re at a tailgate party, you might not want to wait that long for your food. Coleman definitely delivers when it comes to this top quality portable gas grill. For under $150, you get a versatile grill that is able to cook your food just the way you like it. Yes, it will take a bit of practice to learn how to get the right temperature for cooking your food. But then, so do a lot of other grills on the market today. And despite its heaviness, the cart makes everything so much easier. Road tripping will never be the same with the LXE. Napoleon is Canada’s answer to Weber. They produce top quality grills that often bear a striking similarity to Weber grills. However, Napoleon is also well-known for its innovations and designs that ensure that they aren’t simply carbon copies of the other popular brand; they can actually be even better. The company produces several portable grills, one of which is the TravelQ 285. This grill has a powder coated steel body and a 285 square inch porcelain-coated cast iron cooking grate. There are two stainless steel burners that each has 6,000 BTUs. The Jetfire ignition system fires up the burners and two control knobs allow you to control each one independently. The lid has a built-in temperature gauge that lets you check the temperature inside the grill without having to lift the lid. The lid also serves as a barrier to the wind, so the flames remain protected while you’re cooking. The grill also comes with folding legs. The TravelQ 285 is pretty compact at only 24 inches wide and 14 inches high. And it’s also quite light in comparison to other portable gas grills, weighing at 20 pounds. One other feature that must not be forgotten is the removable grease pan. You have greater versatility in cooking compared to other portable grills in this category. You can do 2-zone cooking (direct and indirect cooking). You can also cook two different types of food and have them finish cooking at the same time (i.e. medium and well-done burgers). You can also opt to bake or smoke food at low temperatures with this grill. the grill has a locking mechanism that snaps shut and stays shut, holding the lid in place while you transport it from one place to another. the body of the grill heats up quickly and provides limited heat retention. The Napoleon TravelQ 285 is really one of the best portable grills in this category. It has solid construction that, with a bit of TLC, ensures it will last for several years. 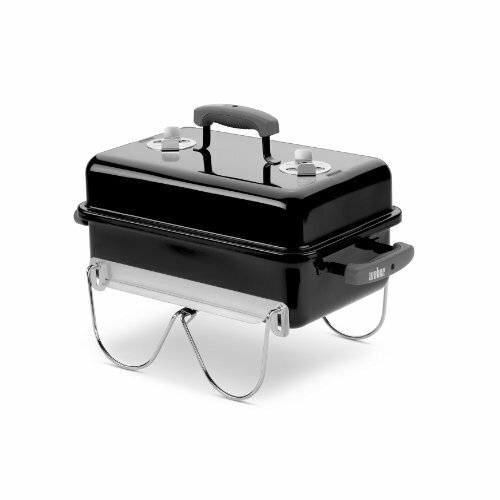 It has two burners that can be individually lit which greatly increases the grill’s versatility. You have loads of cooking space. And the lid provides you with a handy barrier for windy days in the park or at the beach. If you’re looking for a grill to accompany you in your travels, you might want to check out the TravelQ 285. This portable charcoal grill is a design award winner, and it’s easy to see why. Available in various colors, this little grill actually looks like a bowl but a really cool one. The colored outer bowl has vents that allow air inside. It also has a battery-powered fan which fans the flames (yes, pun very much intended). Then there’s an inner bowl where the magic happens. Located inside the inner bowl is the fire chamber where you put some liquid gel fire starter, light it up, and then place the small charcoal basket (which is more like a large can) on top. The heat generally stays within the inner bowl. Even with the charcoal burning at extremely high temps, the exterior remains just a bit on the warm side and is still cool enough to touch. Even the bottom of the grill is tabletop safe. The grill doesn’t come with a lid and adjustable air vents. But the fan’s speed is adjustable, so you can still control the temperature of the grill. The other parts of the grill is a 124 square inch stainless steel cooking grate that locks in place. The grate has a solid circle in the middle to prevent grease from dripping on to the burning coal, preventing flare-ups. So, what do we love about this grill? It’s light (around 9 pounds) and colorful. It’s tabletop safe. It lights up surprisingly fast, around 5 minutes tops. And it reaches extremely high temperatures – 600 degrees Fahrenheit. And though it is a smokeless grill, there still is a smokey flavor on your food after cooking. Cleanup is relatively easy because the removable parts are dishwasher-safe. It’s worth to note that the part where the solid metal circle meets the grate is a bit harder to clean because scourers sometimes get caught in it. What don’t we like? The heat isn’t distributed evenly because the charcoal bin is located exactly under the middle of the grate. This means that you’ll have to move your food around a bit to get even cooking. The grill runs on 4 AA batteries, and these can run the grill for an estimated 40 hours of cooking. However, you could also run out when you least expect it. Plus, it’s only good for feeding 2-3 people, possibly four max. If you have a larger group, you’ll need a portable grill that’s bigger. Lastly, it doesn’t have a lid so if you need to do the more oven-like cooking; you’re out of luck there. Overall, this is a great grill for a small group. It has a lot of features we like in a portable grill – lightweight lights up fast, and can reach extremely high temps. While the uneven heat distribution could be a bit annoying, it isn’t that big of a deal breaker. For its price, it’s definitely a front-runner as one of the best portable ones you’ll ever find. There’s no question that when it comes to charcoal grills, nobody does it better than Weber. And this portable grill is a masterpiece as usual. Over the twenty years since it was first introduced to the public, the Go-Anywhere have been making customers happy all over the world. So, what makes this grill so popular? This rectangular-shaped grill is one piece of solid engineering – no nuts and bolts to hold parts together. It is made of porcelain enameled steel with a 160 square inch triple-plated nickel grate. There are adjustable air vents located at the top of the lid and the bottom. It features pivoting legs that swing around to the top of the lid to lock it in place when you’re transporting the grill from point A to point B. What do we love about this grill? There’s no assembly required. You can use it as soon as you get it. Just swing the legs around to a standing position, lift the lid, load up on the charcoal, and light it. It’s lightweight (14 pounds) and can be carried around with one hand. While a bit heavier than the Lotus Grill, it’s still easily transportable from one location to another. Like all Weber grills, this one is incredibly durable and will last a lifetime. When the vents are closed, the grill is airtight which means you can effectively suffocate the fire and save on charcoal. The price is pretty low; you really get great value for your money. You get a handle on the lid plus side handles so you have the option of carrying it with one hand or with two. A good work-around for people who don’t really have the muscles for carrying 14 pounds with just one hand. It takes a bit longer to reach cooking temperature compared to the other two portable charcoal grills we’re reviewing. The height of the cooking grate isn’t adjustable. There’s no access door to the charcoal; you’ll need to lift the grate with all the food on top if you want to add or move around the charcoal. Since heat is controlled with the adjustable air vents, it requires a bit of learning on the part of the cook/chef. The Lodge Manufacturing Company is well-known for producing heirloom cookware. They’ve been around for more than a hundred years, and their products have been known to last almost as long. Now, their products are quite numerous, featuring cookware for indoors and outdoors. But the company only manufactures one grill – the L410 Pre-Seasoned Sportsman’s Charcoal Grill. And this little gem is actually considered a top-of-the-line hibachi (a portable, small grill made up of a cooking grate placed over a brazier), very popular for camping, tailgate parties, and the like. the entire grill (including the handles) can get really hot, so it’s not tabletop safe. You’ll need to use bricks or something similar (nothing flammable) to rest the grill legs on. As an added drawback, the grill stays hot for a long time after cooking. While there are certainly drawbacks to owning the Lodge Sportsman’s Charcoal grill, the praise from customers are never-ending. It’s a pleasure to use, and the food turns out amazingly delicious. Now, it can be a bit messy and to start it up can be a hassle if you’re in a hurry just like a lot of other charcoal grills out there. But the amount of effort you put in pales in comparison to the food that you get in the end. If you’re looking for a hibachi to grace your backyard or your next camping trip, this one from Lodge should be your number one pick. The Q1400 is, as mentioned, a portable electric grill. Aside from this fact, most of the features of this grill are actually similar to what you get with the Weber Q1200 Portable Gas Grill. It has a cast aluminum dome-shaped lid and body. The grate is made out of porcelain-enameled cast iron and provides 189 square inches of cooking space. Like the other Weber Q grill we reviewed, the grates are also split in half to allow replacing one side with a cast iron griddle, increasing the grill’s versatility. It also has an infinite control burner valve. It also has glass reinforcement on the nylon frame to add to its durability. Since this is an electric grill, the Q1400 has a 1560-watt electric heating element and a 6-foot grounded cord. The grill also has an aluminum heat retention liner to lower the preheat time and increase heat retention. because it’s an electric grill, you always need a socket somewhere to power your grill which limits the places where you can bring the grill. Definitely no camping in the wild. weighs 34 pounds so it’s not really that light, more like one of the heaviest on our list of best portable grills. Overall, it’s a Weber grill, so you know it’ll be quality. And the fact that they were able to solve the problem of low heat output from an electric grill is, simply put, amazing. With the Q1400, you get a very powerful portable grill that can produce delicious BBQ anytime, anywhere… as long as you can find a socket. Now, for the price, it is pretty expensive. And you don’t get a lot of cooking space at that. But, if you’re limited to buying an electric grill, this is easily the hottest one you’ll find in this category. Char-Broil is a brand that has been around far longer than the original Weber Kettle. And while it doesn’t enjoy the same avid fan base as the other brand, it definitely holds its own when it comes to producing quality grills that have ingenious designs. Over the past several years, it has introduced its newest innovation – the TRU-Infrared cooking system that employs radiant heat to cook your food rather than convection or conduction heat. This system is reliant on an innovative cooking grate that helps spread the heat evenly across the grill and radiates it directly into the food. This allows the food to cook more quickly. And since there is little to no convection heat (hot air), the food stays moist and tender. The grate also prevents flare-ups and redirects the smoke from the burned drippings right back to the meat. What other features does this grill have? The lid and body of the grill are made of porcelain. It has a total of 245 square inches of cooking space; 180 square inches of primary cooking space and a 65-square inch warming rack. The grate is made of porcelain coated steel while the warming rack is made of porcelain coated steel wire. This Char-Broil grill has a removable dial-control that can be plugged into any 120V power outlet. Like the Weber Q1400, this grill also provides 1500 watts of grilling power. The lid features a built-in temperature gauge that reaches up to 550 degrees Fahrenheit. The grill weighs at 22.5 pounds, one of the lightest in this category. The Char-Broil TRU-Infrared Electric 180 grill is definitely a lot less expensive than Weber’s portable electric grill. It certainly is a lot less light. When it comes to portability, this one would definitely win hands down. But what about cooking performance? The Weber is easily the hottest grill. Although it does heat fast as well as recovers heat quickly, it can’t reach the high temperatures of the Q1400. However, the TRU-Infrared cooking system does seem to work because the meat stays juicy and tender. The Weber doesn’t perform as well. The only downside of this grill is the quick fluctuation in temperature whenever you check on the food and the clean-up. There are definitely a lot of things to love and few things to dislike about the Charcoal TRU-Infrared Electric Patio Bistro 180 grill. While it may not necessarily be our top choice, it’s most definitely one of our finalists. 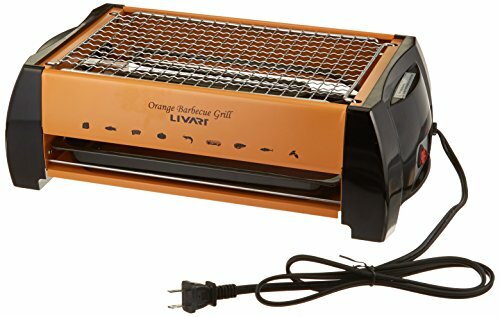 Unlike the previous portable electric grills we’ve discussed, the Livart LV-982 is a unique one. It’s a little open-faced grill that resembles a mini-beach grill. It doesn’t have a lid like the others, and the heating element is exposed. 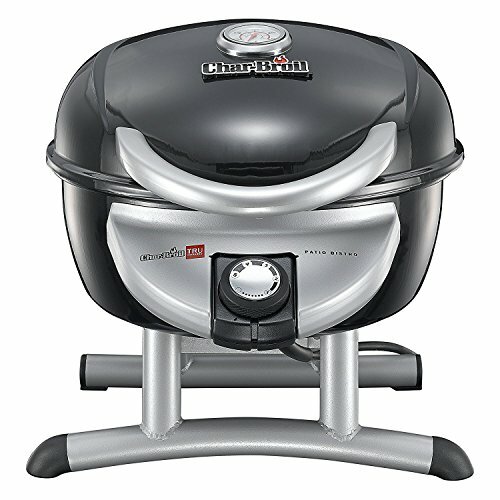 Aside from its unique design, this electric grill has a removable stainless steel grate which has an adjustable height. There’s a bottom tray that catches drippings. This same tray can be used for baking or broiling, giving your grill a little more versatility. Unlike the other electric grills, the LV-982 has only one heat setting – on. The grill doesn’t get overly hot, so you don’t have to worry about burning your food. However, the lack of lid or upper heating element (like what is found in clamshell-style electric grills makes cooking times longer. Placing the grate on the lower height which is nearer the heating elements cook the meat faster. However, the heat distribution is quite uneven in this position; the outer edges of the grate have inconsistent heat which can affect cooking times for food placed in these areas. What are the features? The grill has a stainless steel grate that has 78 square inches of cooking space (around three burgers). The heating element provides 1200W of grilling power. The grill’s body is also made of steel. There’s a grease tray at the bottom that slides out for easy cleaning. The Livart LV-982 is definitely a basic electric grill. It doesn’t have most of the features of the other two we’ve already discussed which is one of the biggest reasons why it also doesn’t cost as much. 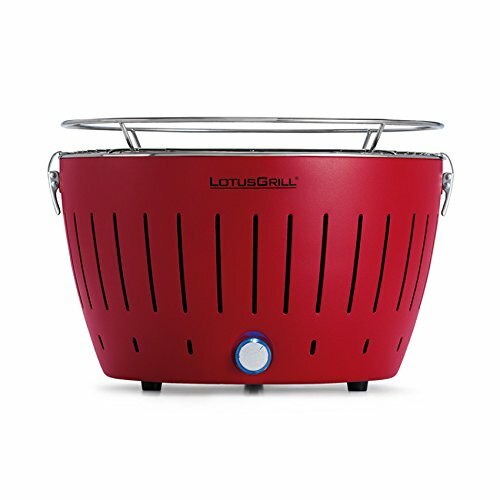 The LV-982 is a uniquely designed grill that has almost the same versatility as the other grills in this category because you’re able to utilize alternative cooking methods such as broil and bake. If you’re on a limited budget and don’t need a lot of features on your portable electric grill, you might want to consider this one. Weber is the gold standard of all grills, and it’s easy to see why. They consistently produce top quality grills that produce delicious results and last for a long time. 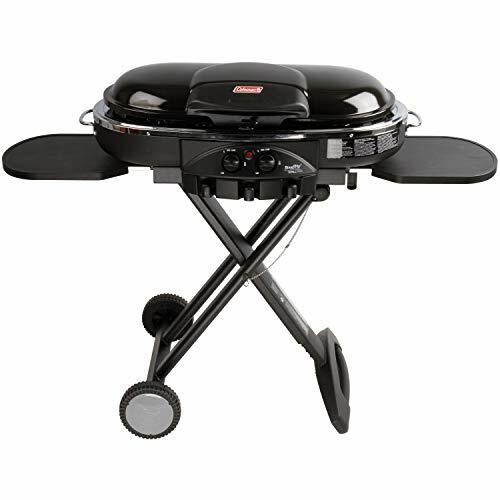 One of their best-selling grills is the Weber Q1200 Portable Gas Grill. The grill has a cast aluminum dome-shaped lid and body. The split cooking grates have a total of 189 square inches of cooking space and are made of porcelain-enameled cast iron. It has one stainless steel burner (8500 BTU), an easy-start electronic ignition, an infinite burner control valve, and a built-in thermometer. 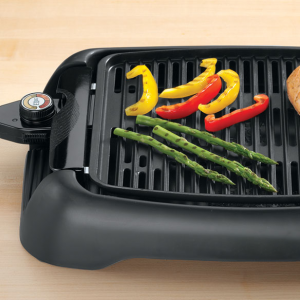 The grill also comes with a removable, angled grease tray and a disposable catch pan. The Q 1200 also comes with fold-out side tables for more workspace. While the grill runs on disposable LPG cylinders, you can opt to purchase an adaptor that allows you to power the grill with larger gas cylinders. The entire grill weighs around 31 pounds. There isn’t much to dislike about the Weber Q1200. It cooks great and looks cool. It’s almost everything you want in a portable grill. The weight of the grill is its biggest drawback, decreasing its portability especially if you plan on carrying it for quite a distance. 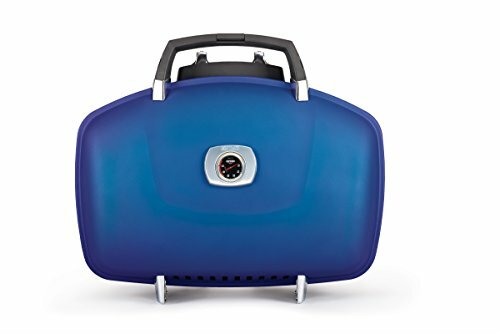 While the heaviness can be disconcerting for some who want to grill on the go, most people are quite happy with the performance and design of this portable gas grill. At almost $200, it’s definitely worth the money. An investment that will benefit you for decades to come. All three portable charcoal grills have their pros and cons. The Lotus Grill lights up the fastest but doesn’t have even heat distribution. The Weber has the largest cooking surface, but it doesn’t have easy access to coal. The Lodge grill is made of durable cast iron (a crowd favorite) and retains heat very well. However, it is prone to rust and the heaviest of all three grills. In short, there are loads of things to love and hate in each grill. Now, YOUR pick should definitely be the grill that meets your needs and budget the best. But if you want us to weigh in, we’ll go with the Weber for several reasons. It’s light and extremely portable, something you’ll want if you want to carry this grill from one location to another (like the trunk of your car to the picnic table). It has the largest cooking surface for such a compact grill, so you get to cook for more people. It is made of rust resistant material, so you don’t have to worry so much about exposing the grill to the elements. You have built-in lid hangers to allow you to create a wind barrier if necessary. You actually have a lid for your grill so you can do a bit of low and slow cooking if you desire. You get even heat distribution, so you don’t have to worry about hot or cold spots. And the price is the best, by far. 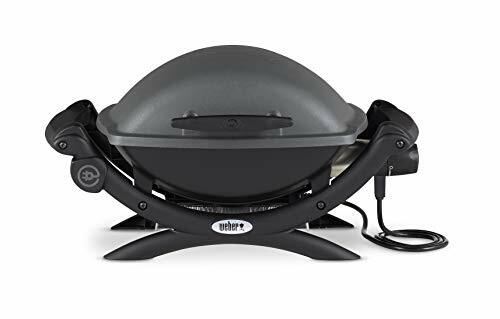 At under $50, you get a top quality portable grill that will easily provide you with delicious BBQ whenever you want, wherever you are. And it will continue to do so for many decades to come. While the Weber Q1200 is definitely a popular choice, the Coleman LXE edges out ahead because of several reasons. It has a larger cooking surface, and it offers more versatility in terms of cooking. In addition, the LXE has more portability because it already comes with a cart at no extra cost. While it certainly is heavier and larger than the Weber grill, you don’t have to carry it from point A to point B. Just roll it around to where you want it. Of course, it isn’t as compact as the Weber, so it has its limitations in terms of application as well. Like the other two portable gas grills, you get even heat distribution. But only the Weber and the Coleman have excellent heat retention. When it comes to the price, the LXE is also a winner. It’s easily the least expensive of the three with almost all the same benefits. So you definitely get more than your money’s worth. And despite the fact that Weber is well-known for producing top quality, long-lasting grills, there’s no indication that the Coleman LXE isn’t going to fare as well and as long as the Q1200. Despite being extremely expensive, we believe that this Weber is well worth the money. Like all Webers, this portable electric grill is solidly constructed, reliable, and durable. It was definitely built to withstand heavy-duty use. The grill is versatile, having split grates that enable you to switch out with a cast iron griddle if you so choose. It is definitely the hottest portable electric grill on the market today. And its heat retention capabilities are just plain awesome. Now, the Char-Broil TRU-Infrared Electric Patio Bistro 180 edges out the Weber when it comes to cooking performance because of its innovative grate. Food cooked on the Char-Broil remains juicy and tender but food cooked on the Weber can dry out quickly if you’re not careful. The high heat can cause the food to cook more quickly than you anticipated, making for rubbery meat. Fortunately, this is merely a learning curve you’ll need to overcome. Over time, you will get the hang of cooking food on this grill. So, what makes the Q1400 way better? Some features on the Weber simply tip the scale. It has an incredibly long cord which enables you to be more flexible on where you place the grill. It also has excellent heat retention capabilities which means food cooks much faster. Cleanup is way easier on the Weber. And the grill comes to you fully assembled out of the box. No work needed. If you’re looking for a truly portable electric grill, the Weber Q1400 is quite possibly the only choice for you. Portable grills are probably one of the best things to have ever been invented. You get to enjoy delicious BBQ anytime, anywhere. You’ll definitely be experiencing outdoor grilling at its finest. Whether you’re off to experience some one-on-one time with nature, have some fun at the beach, or travel from coast to coast by your RV, you’ll never have to go without food that’s cooked to perfection.